Some welcome rain fell on dry corn fields this week, followed by more warm weather. As a result, we are seeing rapid corn development in the fields. Early harvest has begun in some transplanted and mulched fields. Corn pest activity continues to be very low in cornfields this week, so very few fields have needed sprays. Weather predictions for the coming week indicate warm air and moisture coming up from the south, which may bring in significant numbers of corn earworm and fall armyworm. European corn borer: There was very little borer activity in both pheromone traps and fields this week. Moths were only caught in three locations: Cape Elizabeth, Dayton and Wales. They were below threshold for silking corn at all of these sites. Feeding damage was also light, with only one field in Oxford being over the 15% spray threshold for pre-tassel to silking corn. Corn earworm: No moths were caught in our pheromone traps this week, and therefore no sprays were recommended. 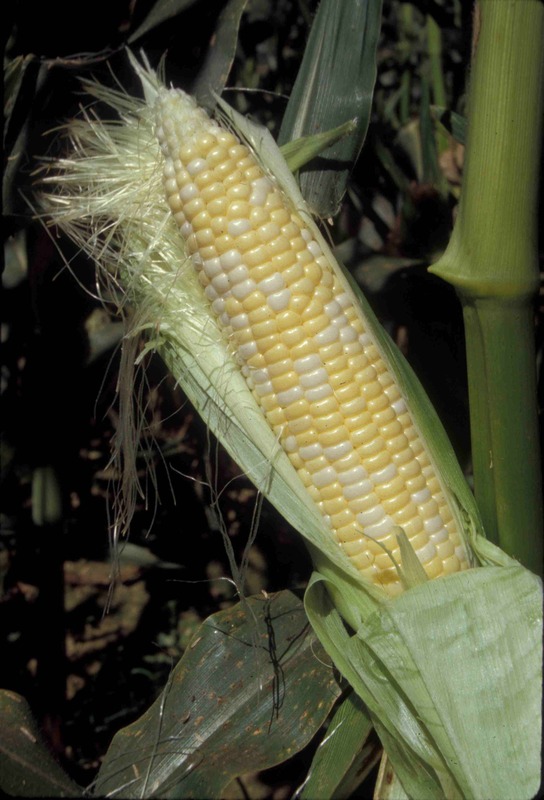 There is more silking corn available for earworm moths to lay eggs on this week, so the threat is increasing. Growers should be alert for changes in the weather, such as storms moving in from southern states, that could bring more corn earworm into Maine. Fall armyworm: No moths were caught in our pheromone traps this week, and we have not yet found any feeding damage in the cornfields we’ve scouted. We have found a few common armyworms within corn plants behaving much like fall armyworm. However, these larvae will be pupating very soon and are not likely to get into the ears. Like corn earworm, the situation for fall armyworm could change rapidly with weather coming up from the south next week. Squash vine borer moths were caught in pheromone traps in Biddeford, New Gloucester, Lewiston, Nobleboro, Farmington and Oxford this week. Only the Oxford site, which had 11 moths, was over the 5-moth spray threshold. All other sites were below the spray threshold, but we expect counts to increase state wide in the coming days. 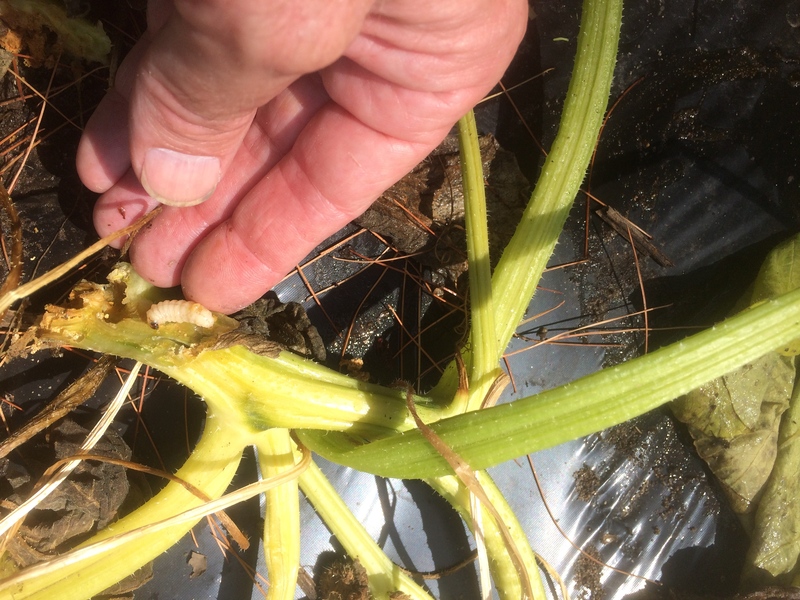 Growers with squash in southern Maine should be scouting for vine borer symptoms and protect squash plants if moths or damage are seen. See the 2018-2019 New England Vegetable Management Guide for control options. 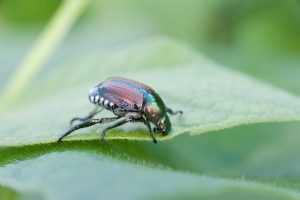 Japanese beetles are now appearing in southern and mid-state areas. These insects often find their way into cornfields and feed on the leaves, causing an interveinal skeletonizing, which is generally not significant. However, they may also feed on the silks of developing ears, causing poor tip fill. Sprays for European corn borer and/or corn earworm (except Bt’s) usually will control Japanese beetle as well. Spotted wing drosophila: The first capture of spotted wing drosophila (SWD) occurred this week in berry fields in southern Maine. These small fruit flies can cause serious fruit losses in raspberries, blueberries and other soft fruits. This pest has already reached damaging numbers throughout much of New England, which is about 2-3 weeks ahead of what we have seen in the past few years. For more information visit our SWD blog. 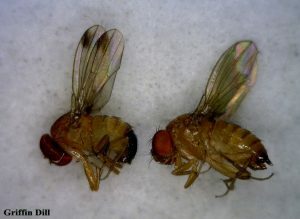 Male (left) and Female (right) Spotted Wing Drosophila; photo by Griffin Dill. Actual size: 2-3 mm. Where brand names or company names are used, it is for the reader’s information. No endorsement is implied nor is any discrimination intended against other products with similar ingredients. Always consult product labels for rates, application instructions and safety precautions. Users of these products assume all associated risks. Contact pamela.stpeter@maine.edu or call 207.933.2100.